PV System and Application Team (PVSAT) is only the team that considers PV system not to be a photovoltaic device but to be a power generation system. Our team’s research objective is to improve “PV system for the welfare of PV users” and “PV system as a player of energy infrastructure”. Both our government and PV industries say that PV modules should have over-20-year lifetime. However, many of the PV modules are in places which are invisible to the PV users. Besides, the PV system is operated without any noise and moving parts, and its output much depends upon fluctuating weather condition as well as its surroundings. These conditions make it difficult to find meaningful performance drops and increase in safety risks hiding in it. In addition, PV system can’t stop generating dc voltage in daytime even though it is not operated. This characteristic may cause a risk of electrical shock of firefighters in case of PV fire accidents. So we have been studying both technical and institutional solutions to improve electrical safety of PV system based on field survey and research activities. Concerning “PV system as a player of energy infrastructure”, on the other hand, the methodology of forecasting PV power generation has been discussed. Not to mention it that, output electricity strongly depends upon weather condition. The characteristics of PV power generation systems are their instabilities. When the large amount of PV systems will be connected to a utility grid, the inevitable fluctuation of their output may have a harmful influence on the utility grid. Using energy storage devices is one of the promising solutions, but their installation should be as small as possible from an economical viewpoint. So, we have been developing the forecasting methodology of PV power output which is the key to control stability of electricity grid and optimize installation logistics of the energy storage devices. 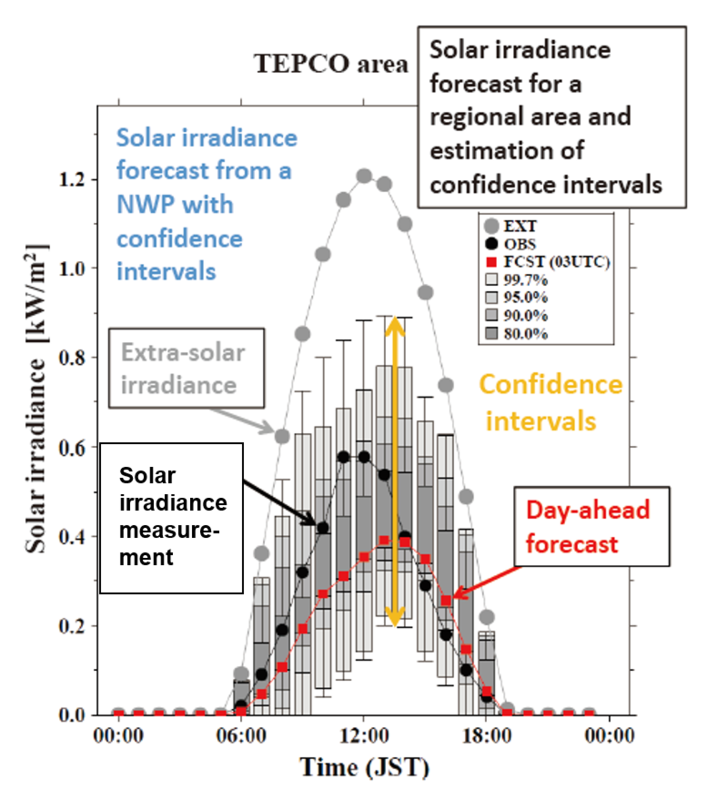 Figure 1 shows an example of time series of solar irradiance measurement and day-ahead forecast from a numerical weather prediction model with confidence intervals for Tokyo Electric Power service area. Our team is also studying innovative system control devices which enable improvement on performance and reliability of PV system. Fig. 1 Comparison of solar irradiance measurement and day-ahead forecast from a numerical weather prediction model(NWP).